Not sure how they’ll solve the weight-of-fuel problem. Battery or generator, it seems like getting power for acceptable range is a problem. The massive voltages/current in a saltwater water application don’t excite me but that seems manageable with really good engineering. Wonder how the house batteries in my Grady will work to boost this guy 35 miles offshore?? I wonder how much the battery system would weigh for something needing triple's and what they are they saying range is? As Ron White said.....................how far will the plane fly on one engine? Answer- To the scene of the crash. philr21, fin-sanity, AGENT86 and 8 others like this. 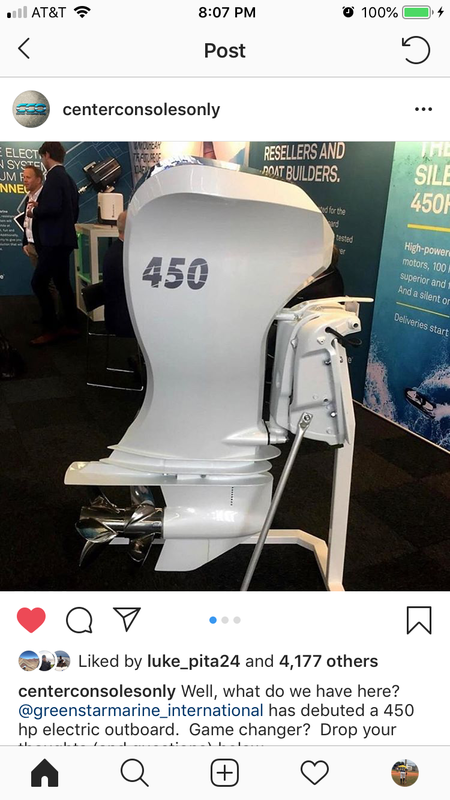 This will probably be nice for bass boats on lakes that don't allow combustion motors, but the range will certainly make it useless for offshore boats. Stickbo and THT Mod 9 like this. coores14 and On the Half Shell like this. Hole shot would be insane as electric motors make 100 percent of torque on start...If the prop could stay hooked up. philr21, captchuck25, cummins28 and 2 others like this. Lotta rake on that DP. Awesome. I love the idea and the initiative. However, how about starting with like 150 or 200hp instead of 450. No online info I can find?? Given battery and gen size requirements plus cost of motor itself I'll bet a quarter of my own money :D that it'll be $100k just to hang and rig it. I would like to find some info though . 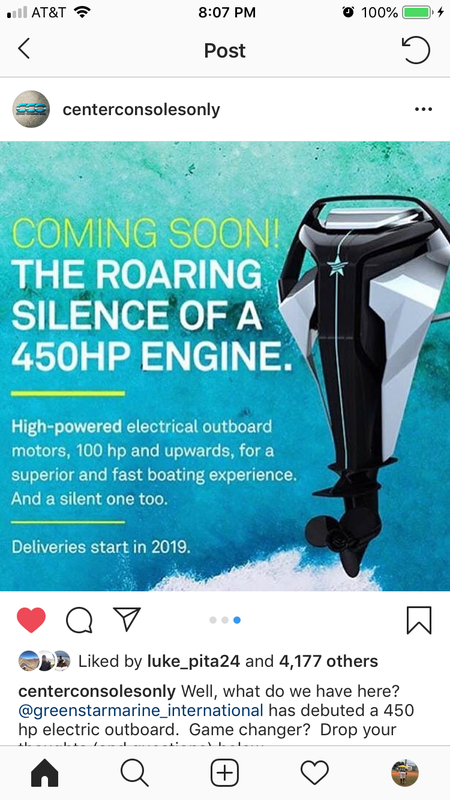 . .
Soooo, how long would the boat be that would run a 450? 24 to 28? I could see the hot Tesla owners now as they pull up and there is a trailer blocking the 5 charging slots hehehe. RiptideCharters, Captain AL and Tainui like this. Solar panels on the t-top will run motors. With $100k worth of batteries, that thing will push a boat the boat maybe 50nm at normal CC speed. Or you could put a 350kW diesel generator under the console. Purpose built for this service, you could probably pare gennie weight down to about 4000lb. Yep, that works either way. Rig a trip boat with 2 of these on the outside and a 425 yamaha center and you'll have a nice hybrid on your hands. CANARIANFISHER, party marty, scubabum and 2 others like this. Just doing a quick google on how much watts it takes to make that power, 335500 watts - I think we're looking at 7000 amps @48V to make 450hp. Looked up a 350kw generator's weight and it looks like around 8-9 tons, but that wouldn't be very silent would it. I'm curious how this is going to work, good luck to them. Yeah, this is the application. Perfect for a trailer queen or inshore boat on a lift behind your house. Also, I think an inboard would be better. An electric motor is comparatively small. No dog house needed.